Following the success of the 'Playing Out' scheme in Bristol, Sutton Council is meeting with Local Mums Online to pilot a scheme to close streets for children's play. 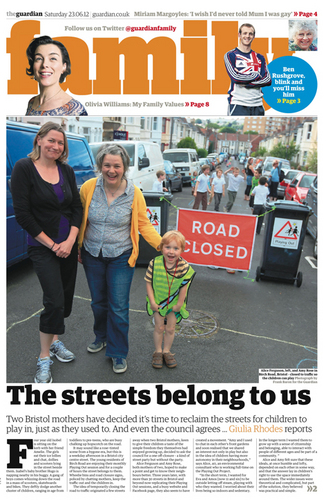 The idea of temporarily closing the road to traffic started when two Bristol mothers, keen to give their children a taste of the simple freedom they themselves had enjoyed growing up, decided to ask the council for a one off-closure – a kind of street party but without the party. Hearing the two mothers talking on Women's Hour, Kathy McGuinness, founder of Local Mums Online, tweeted 'Reclaim the streets mums, these mothers did!' with a link to the story of the Bristol mothers' road closures. Head of Sutton Council Ruth Dombey responded to Kathy's tweet with a simple "I love it! Let's do it in Sutton!" and the idea of closing streets for children's play in Sutton was born. Ruth asked Kathy to suggest two streets that could be closed for a pilot scheme in Sutton. Kathy put a call out on the Facebook group Carshalton Mums (700 members) and was inundated with replies. "Everyone thought it was a fantastic idea and within minutes over 20 streets in Sutton and Carshalton were nominated." "Playing out is a wonderful way for neighbours to get to know one another and develop a sense of community," said Kathy McGuinness. "It is only recently that streets have been dominated by cars; even up until the late 1970s children played in their own roads. It could really help vulnerable children develop social skills and help fight the childhood obesity epidemic." "As the Bristol mums pointed out, it's important to remember that streets are not just for cars," adds Kathy. "Families have the right to use their streets too - if only for a couple of hours a month!" "We are delighted with the response from Local Mums," said Ruth Dombey at the meeting. "We are confident that the pilot scheme will be a success and we can roll out the scheme across the Borough." Two streets in Carshalton will be closed for the pilot scheme in September 2012 on a chosen weekday between 3.30pm and 5.30pm. Watch out for lots of photos of happy mums and children on this site soon!